It’s no secret that the US stock market has been going up for years. It’s had a couple of short dips, but the sharp upward trend since 2009 has been unmistakable. The higher it climbs, the more I get worried. As a value investor, I like to buy stocks when they are cheap. Do you notice anything about what happens when the number gets high? I’ll give you a hint, look at the only two times the number passed 30. We had the stock market crashes of 1929 and 1999. It got up to around 27 before the crash in 2008. Today the number sits at 29.87. Now the number could go up to 45 like it did in 1999. It could even go higher. However, just looking at the graph, it seems like anytime it is above 25 there’s a coming in a year or two. We’ve been above 25 for awhile and spiking to 30 is giving me cause for concern. I know what you are thinking. Didn’t I ask if it was Time to Sell Your Stocks? almost 3 years ago to the day? Didn’t I again ask if it was Time to Pull Out of the Market? about 2 years ago. Even this January I suggested there was gloom and doom coming, because we KNOW where the stock market will go. So what makes this time different? 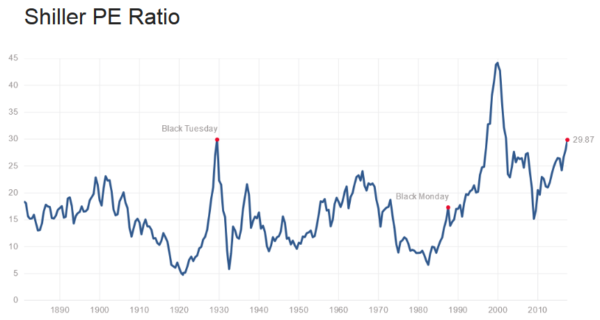 Other than the Shiller PE number reach 30, I don’t have a great answer. I’m not pulling out of the US stock market. Instead, I’m looking more at my asset allocation. I’ve always been a fan of international investing as you can tell from this 2007 article. A lot of experts would cringe at the idea of putting so much of a portfolio in overseas funds. I think there’s no better time to embrace international investing. The Shiller PE numbers in many countries are a lot lower than the United States. There may be obvious political or economic reasons for that. However, in general, they represent the kind of value that I’m looking for when I invest. For the first time, I’m putting money in bonds and REITs. Specifically, I’m buying Vanguards’ BND and VNQ ETF funds. I’m putting about 10% of my portfolio in BND and another 5% in VNQ. Perhaps I should have done this before now. I’m thinking about upping those percentages as well. What do you think of this market? Are you doing anything differently than what you’ve done before? * For football fans, I’m calling more big nickel defenses and playing less of my base defense. Filed Under: Asset Allocation, Investing Tagged With: 2017 crash? Yesterday I introduced you to Motif Investing (introduction here). The quick takeaway: it is a great way to buy up to 30 stocks with one single brokerage fee of $9.99. Oh and one other minor detail: they’ll pay you up to $150 to do it. I’m seriously considering trying it out myself. It seems ideal to run a set-it-and-forget-it-until-you-rebalance-it investing plan. Over the years, many people have written about “Lazy Portfolios” consisting of a few ETFs designed to broadly diversify your investments. It only makes sense that the Lazy Man have a Lazy Portfolio, right? My last attempt at a lazy portfolio was almost 7 years ago to the day. I imagine that portfolio with bonds and global real estate would have weathered the banking collapse in 2008 better than some portfolios. I know that there’s no perfect portfolio for everyone. We all have different risk tolerances. Someone older would probably want more bonds and fewer stocks. That said, here’s a brief explanation of why I went with the above assets and percentages. I wanted to invest equally in United States and international companies. I think it is a little self-centered to invest a huge amount in your own country, because a bad economy will doom you twice: poor local job prospects and a crashing stock market. However, the United States has many companies that do business globally… in some ways there is an international component to the US-based companies. Within the US companies, I wanted to put more money towards small capital stocks. I’ve read in numerous places, that over the long term they’ve performed better… with small cap value doing particularly well. Also, it looks like 70+% of VTI is in large capital companies. The Small-Caps balance that out. On the international side, I went with three funds. The Vanguard Total International Stock is a bit like Vanguard Total Stock Market in that it doesn’t really reach everything very well. A quick look shows that around 65% of it is in Europe and Japan and 80+% are large companies. Vanguard Emerging Markets helps diversify to smaller countries. Finally, I put a small amount into frontier markets because I like them for the reasons outlined here. The end result of the above is 80% in stock markets. I still young (at least people tell me that), and I’m an aggressive investor. I’m also looking at doing this with money that I don’t plan to touch for 30 years. This gives me the ability to take a little more risk to get higher returns. I may invest my 2 year old’s money in it, so again, aggressive is good. The last 20% is divided evenly into real estate and bonds. These are not correlated with the stock market, so it gives me a little diversity. I thought long about putting a commodity ETF in there, but they haven’t performed as well I hoped. I didn’t find a commodity ETF that I was particularly enamored with. While on the topic of being enamored with ETFs, you may have noticed that whenever possible I went with Vanguard ETFs. They are well known for keeping their expenses really low. This way more of my investment goes towards the investment, not the managers of the investment. There might be one or two stocks with lower expense ratios, but that gets to be a little like chasing pennies. As you can see my effective expense ratio (minus the $9.99 Motif Investing commission) is 0.143, which means that I am paying $14.30 in expenses for every $10,000 I invest. One can make an argument that I should take the iShares MSCI Frontier 100 out. It has, by far, the highest expenses. If I left it out, it would lower my expense to $10.40 in expenses for every $10,000 I invest. Is it worth it? Maybe, since it is a small part of the portfolio and a pretty non-traditional investment to begin with. What else should I look into with here? In some ways, I’m already stretching the limit of “Lazy” by having eight stocks in a Lazy Portfolio. However, I’ve got room for 22 more in my Motif, if I want to get more detailed. Should replace some of the US large capital with some US mid-caps? Should I go into a global real estate fund like I had mentioned back in 2007? What would the expense ratio ramifications be of that? Should I look into adding BRICs in my international allocation? What about an international bond fund? So many questions. Hit me up in the comments with your answers. A Chink in Index Funds’ Armor? I got my July 2013 edition of Money Magazine yesterday and on page 43 there is an interesting article about balancing a lopsided index fund. The idea is that many indexes are weighted by market capitalization which means that when Apple was trading was $700 index funds needed to have a ton of it. As we know now that was the wrong time to buy Apple. In fact, this kind process leads to investing in stocks that may be in a bubble and undervaluing stocks that could be buying opportunities. So Money Magazine asks the question, “Is it time for you to rethink indexing?” They quickly answer it with a no. Their reason is that indexing has proven to be effective over the long haul and few managers beat the average consistently and when they do it is usually by a small amount. It’s not like betting on Tom Brady to beat Mark Sanchez, where you feel good about it happening over and over again (sorry New York fans, we were there in the early 90s). I agree with this. Even with this chink in index funds’ armor, I don’t see a better alternative, especially because you can keep index funds expenses low. Money recommends a total market index fund (something that matches Wilshire 5000) and specifically goes with Schwab’s Total Stock Market Index (SWTSX). I’m a Vanguard ETF guy myself, so I go with VTI the differences here are minimal. The next thing they suggest is Vanguard FTSE All-World ex-US ETF. Their theory is that you can “cover a broad spectrum of domestic and foreign stocks” with just those two. In order to correct this very lopsided allocation, I added a significant amount of Vanguard’s FTSE Emerging Markets ETF (VWO). It brought my US down to around 55%, my Europe down to about 13% and my Asia up to about 16%. In reality it gave me a lot of exposure to BRIC (Brazil, Russia, India, and China) that I had been largely missing. It wasn’t a ton of exposure, I’m still less than 2% invested in India and Russia each. Interestingly the article points out that today there’s a worry that these BRIC economies may encompass too much of emerging market index funds. Considering that the article previous seemed to ignore emerging markets completely, this is still better than nothing. The article suggests looking at iShares MSCI Emerging Markets Minimum Volatility (EEMV) that has a third less in BRICS. I can’t think of the appropriate expression off the top of my head, but this I believe this is over-analyzing things. Most people will have BRICs be about 8% of their portfolio, maybe less. If the minimum volatility option moves it to 6%, it’s not the biggest deal. Should you really worry about the 2% difference divided amongst 4 very large countries or the 50% that you put in one country (United States)? Getting back to the problem of Apple representing a big portion of the US stocks. The article mentions that you can go with PowerShares FTSE RAFI US 1000 (PRF), a mouthful, that doesn’t weigh by market capitalization. However, it is quick to point out that it had bubble problems itself in the past. The best advice that I see from the article is to augment with Vanguard Small Cap ETF (VB). Personally, I have a good amount of this stock, but for a completely unrelated reason, I’ve consistently seen research that small caps perform better over the long haul. The article ends with a section on bond indexes. I believe that to be a bit more complicated than the equities, although the article has some good guidance. Rather than give away the whole store, I’m going to suggest that you buy the magazine or wait for the article to be available online if you are interested in the bond solution. It’ll probably be worth a couple of dollars to you. This past weekend, I was playing with one of my favorite tools, SigFig.com. You add all your brokerage accounts and it gives you an awesome consolidated view. You can read my SigFig review here. There was one thing that stood out… I only had 7% of my stock portfolio in emerging markets. That may make sense for many people, but as I’ve written about before here, I am a firm believer in being diversified in stocks around the world. 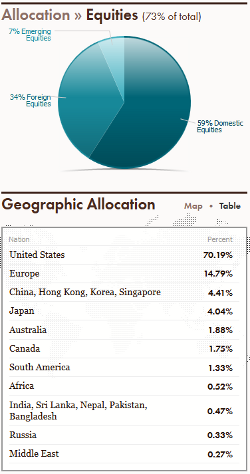 As you can see with the image on the right, I have 70% of my portfolio in the United States and another 15% in Europe. That doesn’t leave a lot for the rest of the world. Remember when BRIC (Brazil, Russia, India, and China) funds were popular a few years ago because those four large countries were expected to grow greatly in economic power in the coming decades? Well my Brazil, Russia, and India exposure seems to add up to %0.8 of my stock portfolio (which is 74% of my total portfolio). I’ve got a little more exposure in China at least. So what do I do about this? The easy answer is Vanguard’s FTSE Emerging Markets ETF (VWO). If you scroll down from that link you’ll see that the ETF has all four of the BRIC countries in the top 7 holdings. With an expense ratio of 0.20%, I know that my returns aren’t going to get eaten up by Vanguard’s management. It’s not like VWO’s 6% allocation in Russian equities is going to revolutionize my portfolio. My goal here isn’t to focus my portfolio on those BRIC countries, but to diversify my holdings so that I’m not so dependent on the United States and, to a lesser extent, Europe. Today’s lesson is simple: check and make sure your asset allocation is what you think it is. It never hurts to revisit it every few months. I thought by buying Vanguard FTSE All-World ex-US ETF (VEU), I had my international exposure well-diversified throughout the world. I was wrong and this is where tools like those from SigFig can be extremely valuable (or you can go with the low-tech method of checking the fund for its diversification).